My newly built Sims 4 styled room Elle's Kitchen N Dining features a modern kitchen with bar and buffet and an enclosed dining area.Download link is given at the end of this post. 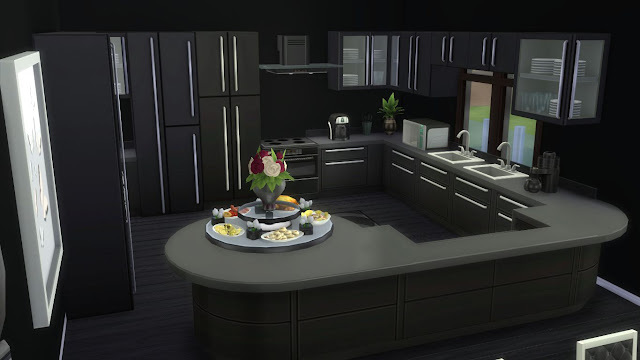 The buffet display is actually the buffet table from Sims 4 Luxury Party Stuff Pack but I placed it here just as a food display integrating it into the counter,for this reason you have to grab the foods from the display and place it on the dining table before your Sims can grab a serving from the foods.To fill the buffet,you have to move the buffet table from the counter elsewhere,then fill it and place it on the counter back by "moveobjects on" cheat and using 9 to move it slightly upper to get the look of the above picture.You can also place your cooked food on the display and this doesn't need moving of the buffet table too. You must Download and Install the following CC before installing my lot to your game,otherwise you'll see missing objects in the room. After downloading extract the downloaded zip file and copy all the files in it to My Documents>Electronic Arts>Sims 4>Tray folder. The custom contents required for this room should be copied to My Documents>Electronic Arts>Sims 4>Mod folder. 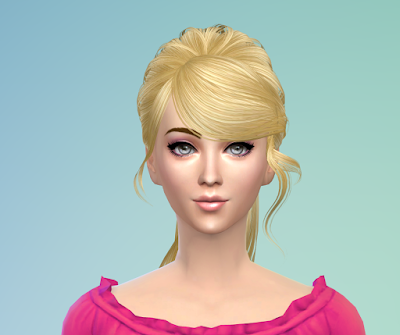 Start your Sims 4 game and go to build mode in your saved game or in a new game. Open your gallery library and don't forget to check "include custom contents" in advanced tab of the gallery otherwise this room won't show up in your library.Now place the room in your game. Please feel free to comment under this post if you face any problem in getting the room to work in your game or simply put your thoughts about this room.